We planted our first section of vineyard, in a south facing field, in May 2005. 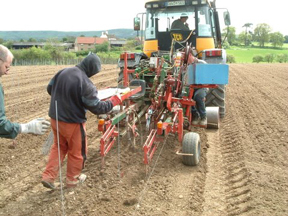 Before planting day, we had ploughed, sub-soiled and power-harrowed the ground. Our second harvest, October 2008, picking the grapes and collecting the picking boxes. On planting day the German planting crew arrived early, and by the end of the day had planted 5 acres, before going off to plant another acre nearby that evening. Their machine's hydraulic horizontal movement is controlled by a laser, so the lines are planted perfectly straight. The planting crew in action in 2005. By December 2009 our first harvest from October 2007 had completed its wine making process and arrived in the farm shop for sale. To find out more about Court Garden Sparkling Wine or to order online visit www.courtgarden.com. Enjoy a wonderful opportunity to go behind the scenes at the Court Garden Vineyard and Winery and find out how this family-run, single-estate vineyard has been growing grapes and producing wine since 2005. All the wines made at Court Garden are produced using traditional grape varieties grown on a beautiful south-facing slope in soil that is very similar to that of north-east France – the region most commonly associated with Champagne. Discover how the maritime climate of this part of Sussex influences the kinds of grape that can be grown, and the flavours they produce. We offer two standard tours, one of which should be available most Saturdays: The original Sparkling Wine & Vineyard Tour, and the more in-depth Winery Tour & Sparkling Wine Flight. For details and dates of forthcoming tours, including online booking, please visit www.courtgarden.com/vineyard-and-winery-tours. Check the current weather conditions here at Court Garden with our online weather station.